Cleaning and caring for your water fountains is the most important thing you can do to keep them in working order. Whether your fountain is large or small, indoors or outdoors, you must clean it regularly to remove white scale and algae for it to continue working properly. Below, you will find a general step-by-step guide to cleaning your fountain. Keep in mind that if you have a fountain made out of a material you aren't sure how to care for, refer to your fountain instructions. How Often Should You Clean Your Fountain? Fountains should be cleaned once per month or every couple of months, depending on the size, to keep water clear and to keep the pump clean and free of algae or white scale buildup. Clean smaller tabletop fountains at least once per month, as they have less water to dilute algae and white scale. You can probably clean larger wall and floor standing fountains every other month. The most important thing to know is that it doesn’t matter whether you have a garden fountain, a small desktop fountain or a homemade water wall, you should be cleaning your water fountain regularly to ensure that it stays in tip top shape. If there are stones in your fountain, take them out and clean them as well. Once you have access to your pump and water, remove the pump from the fountain. This will need to be cleaned as well (see below for cleaning pumps). Empty all water from the fountain; if you have a wall fountain or large floor fountain, empty water out of the fountain with a shop vac (you can get water out however you wish, this is just the way we have found to work best). Clean your fountain in the sink or for wall fountains and large fountains, take a bucket of water and a non-abrasive sponge to clean the inside of the pan. We recommend using a mild soap or a product such as CLR on the inside of the pan to remove any buildup. For the outside of the pan, be sure there are no water drops left to sit on the outside of the fountain. For copper, you can always “dust” it with a furniture polish as often as you would like to keep the outside of the fountain looking polished. Wipe and scrub until you have gotten rid of any algae and/or white scale buildup your fountain may have. Once the pan is clean try, to rinse out any soap or cleaning product by just wiping with clean rags or cloths. Now you are ready to replace your “clean” pump. Cleaning your pump is very important as this is what makes the fountain tick! Your pump will be the first thing to see buildup because this is what the water is flowing through and where the water is filtered. Once your pump is removed from your fountain, place your pump in the sink to clean. Remove the back of the pump, most fountain pumps should have a removable face on one side of the pump. This is where the propeller is. Once removed, take a toothbrush or some other type of brush that will get in the small holes of the pump to clean out any debris. Hard running water over the pump usually will clean most of this out as well. Place the cover back on and hook your pump back up in your fountain. If you can, it is good to clean out the tubing that connects the pump. This is a little trickier as it is hard to get inside it, but even hard running water through the tube will clean out a lot of build up. Learn how to remove water calcium deposits, white scale and algae growth from your water fountain. These pesky pollutants can turn your lovely indoor fountain into an unsightly mess. Follow the simple steps below to get solve each of these problems. White scale can be hard to get rid of in water fountains if it is allowed to build up for too long. The best solution is to prevent it from forming altogether. To do this, you can use distilled water in your fountain or use a fountain care product such as Protec Scale and Stain Remover. CLR - Calcium Lime Remover - This is something you will find at a home improvement store or a discount store such as Wal-Mart or Target. It is a general kitchen/bathroom cleaner used for removing mineral deposits. Be sure you use a soft, non-abrasive sponge to scrub your fountain. Vinegar and water may help get rid of some of the deposits as well, you will want to leave this sit on your fountain for awhile to let it work and break down the deposits and then scrub with a non-abrasive sponge. Algae in your fountain: Algae is going to occur over time in your water fountain because anywhere there is water, algae will grow. The best solution is to clean your fountain regularly as explained above and to use a type of water clarifier and algae preventative. 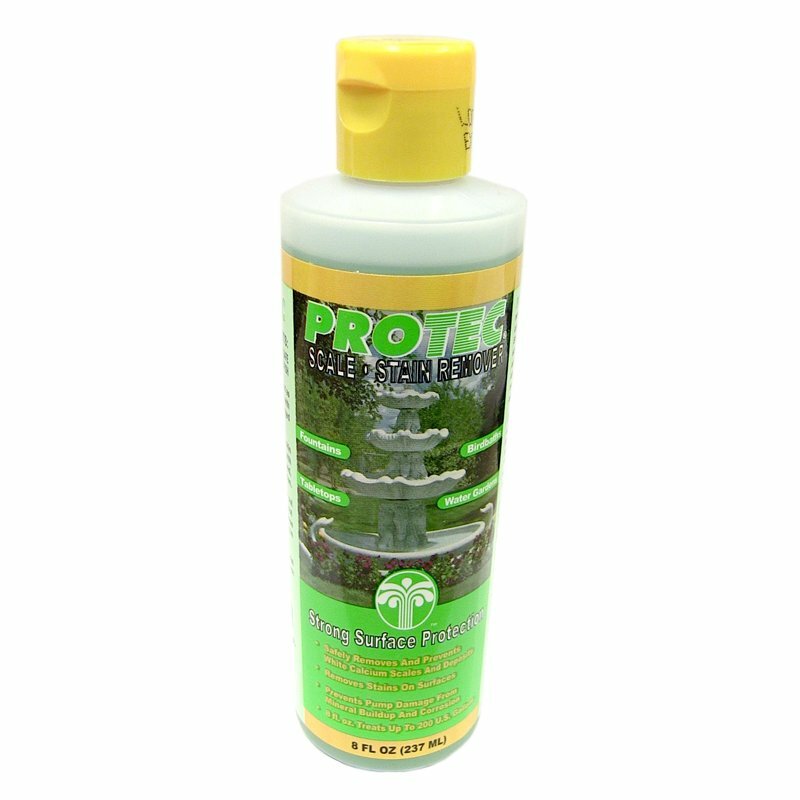 Even though using a fountain care product will slow algae buildup, you will still need to clean your water fountain. Algae buildup is easily removed by following the cleaning instructions above and can be prevented by keeping your pump running all the time. · Fountain Care Tips & Advice Center. · You can also Contact Us to find our more information. We look forward to helping with all your water fountains and fountain care needs. Should you have any other questions, please don't hesitate to contact us.